Royal de Luxe, the world’s leading street theatre company, returned to its second home for an unforgettable show from Thursday 4 to Sunday 7 October 2018 which saw 1.3 million people see Giants roam the streets of Liverpool and New Brighton. The theme for their final visit and the last ever Giant Spectacular in the world was Liverpool’s Dream. The people of Liverpool City Region have held a special place in their heart for the Giants since their first visit in 2012 and for their final Giant Spectacular ever, these Giant guests proved that dreams really do come true. NoNonsense built a number of viewing platforms around the city and rigged the giant sandal in Princess Park ready for the football match. 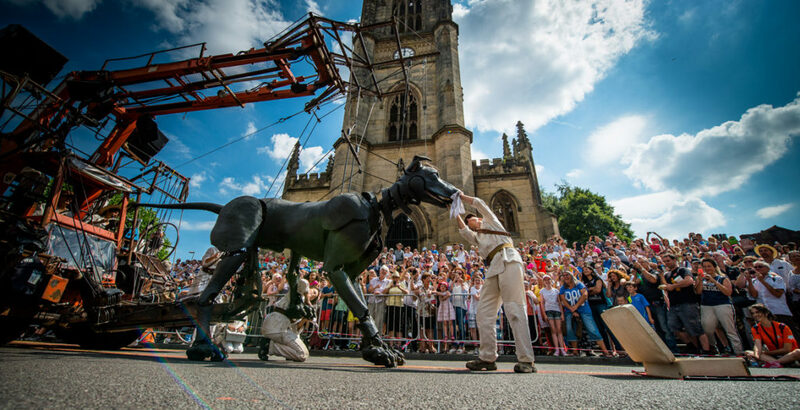 An independent report has revealed that the finale of the Giants trilogy is officially the biggest free event EVER to be staged in Liverpool and Wirral. Liverpool’s Dream brought in 1.3million visitors to the city and Wirral, and generated a massive £60.6m for the local economies. Broken down, this equates to around 1,220,000 visitors to Liverpool bringing in £58m, and 80,000 to Wirral, bringing in £2.2m.